Nail Clipper Set of 5!! WOAH Check This Out!! TOTALLY NOT SATISIFED WITH YOUR NAIL CLIPPER SET? - NO WORRIES. We provide 60 days MONEY BACK GUARANTEE with every purchase! 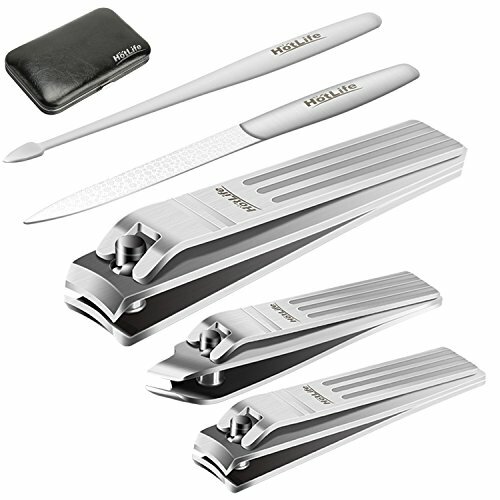 The HotLife Nail Clipper Set is available at a Low Promotional Price for a Limited Time only! Click the Add to Cart button Now! A MUST-HAVE PERFECT NAIL CLIPPER SET - Includes fingernail clipper, toenail clipper, angled blade nail clipper(This angled clipper can cut your nail corner easier), nail file, nail cleaner. Best tools for personal manicure and Pedicure. TOP STAINLESS STEEL MADE - High quality material never rusts or corrodes. Sharp blades delivering a more confident and easy clip. Every piece was heavy duty designed and made for durable. GREAT FOR TRAVEL - HotLife Premium quality nail clipper set with Luxurious Travel Case size is 4.9 x 3.1 x 1.2" which doesn't occupy space no matter wherever you travel. It's very suitable as a gift for both men and women. MORE HEALTHY - This is a very nice manicure kit to prevent virus crossing infection between fingernail and toenail. LOOK HERE, THE BEST NAIL CLIPPER SET IS IN TOWN.......Let's see what do you get from the HotLife manicure and pedicure kit. * Fingernail clipper and toenail clipper are pretty good to reduce the risks of rivus crossing infection between fingernail and toenail. * Angled blade nail clipper can cut your nail corner easier. * Nail cleaner helps you to clean dirty things under your nails. * Nail file helps to improve your nails shape and radian. * Solid stainless steel material never rusts or corrodes, made for durable. * Very convenient to carry and store for your travelling. * 100% Money Back Guarantee - No more worries about losing money in case of you're not satisfied with your nail clipper set. So what are you waiting for? Just to order it now! Definitely you will be happy with your decision!